Group Picture taken 10/28. Front Row: Pierson Perez, Louise Solomon, Isabella Padron, Fiorela Mira, Frances Franklin McGovern, Dante Fiore, Diane Lang (Conductor), Susan Conklin (partially obscured), Rosalinda Perez (Artistic Director). Second Row: Christopher Neils, Andres Perez, William Ramey, Arlene Linke Third Row: John Taylor Thomas, Daniel Gurniak, Terence Hyde, Laura Heckmann, Nell MacDonald. Tickets: Adults $20, Students/Seniors $15. Group Rates Available. Please call 845-709-2273 to reserve tickets. 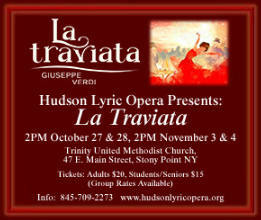 For information call 845-709-2273, or email to info@hudsonlyricopera.org. 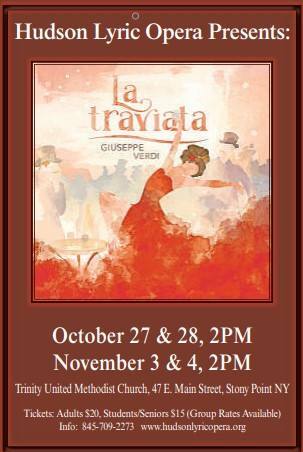 La Traviata (The Fallen Woman) is a 3 act opera composed by Guisseppe Verdi in the 1850s. The setting is mid-19th century France, and is the tragic love story between Violetta, a courtesan, and Alfredo, a young man. The story comes from a novel, La Dame aux Camélias, by Alexandre Dumas fils. This novel was adapted into a play by him, and is known in English as "Camille," which has been performed many times on Broadway. Many films are based on Camille, most recently Moulin Rouge! (2001) by Baz Luhrmann, starring Nicole Kidman and Ewan McGregor. 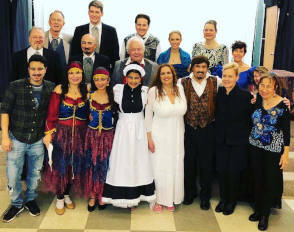 The Hudson Lyric Opera, now in its twelfth season, is comprised of many talented artists who live or work in the lower Hudson Valley. 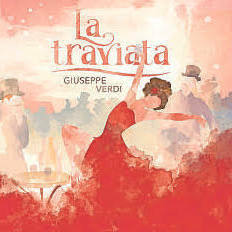 "La Traviata" is the second production this year (2018), as "The Magic Flute" was presented over two weekends in June. We look forward to seeing you soon!